Please use the calendar to check our availability and book online. Sorry we do not accept dogs. Reservations / bookings are subject to our booking terms and conditions. We will confirm your booking on receipt of your deposit. All rates are fully inclusive of picnic table, fire pit and grill, hot showers and a communal washing up area, complete with fridge / freezer and phone charging points. We have a selection of kayaks, body boards, buckets and spades etc available for use on a first come first served basis. During school holidays we only take week bookings Saturday to Saturday. We love dogs and have two of our own, including Rhian our working sheep dog. However, because we keep sheep we do not allow dogs on the site…….Sorry. Meet your hosts: Fran & Richard. Fran is a local girl born and bred in Whitesands. She has a wealth of local knowledge which she is more than happy to share with you. 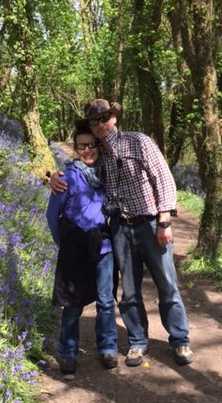 Richard is a Londoner who fell in love with Pembrokeshire and moved down in the 80’s. Now, he spends too much time playing on his tractor and lighting camp fires!